You're sure to find some of these gadgets a-peeling for the holidays. What makes a perfect stocking stuffer? IMHO it should be something small in size, inexpensive, and make the recipient smile. What fits the bill better than kitchen gadgets and treats?! From baking accessories to bite-sized snacks, the chef in your life is going to go wild for these stocking stuffers. 1. 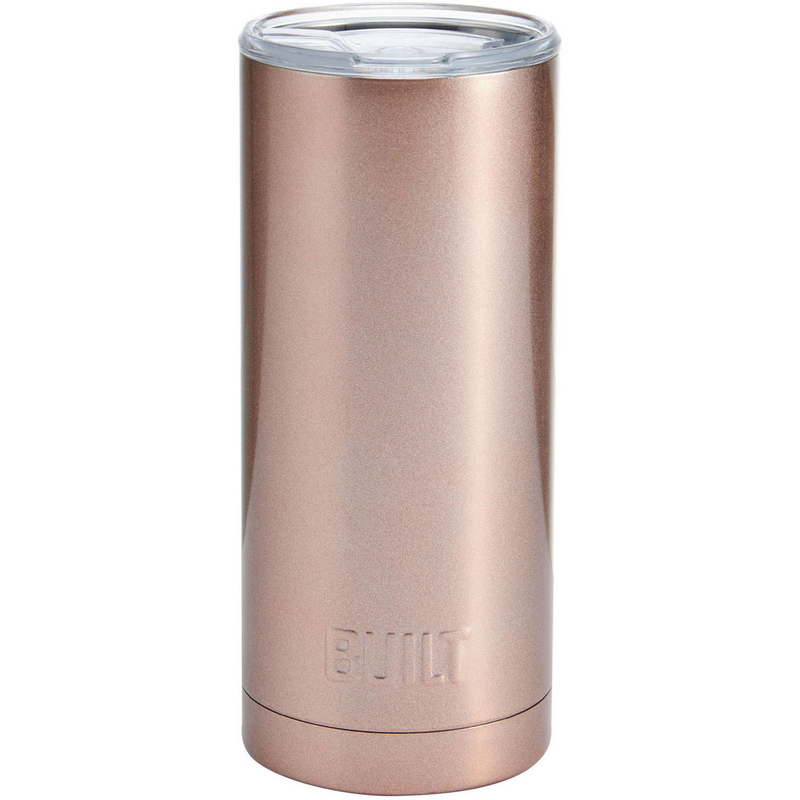 A stainless steel tumbler to keep your roomie's high-quality coffee hot for six hours. 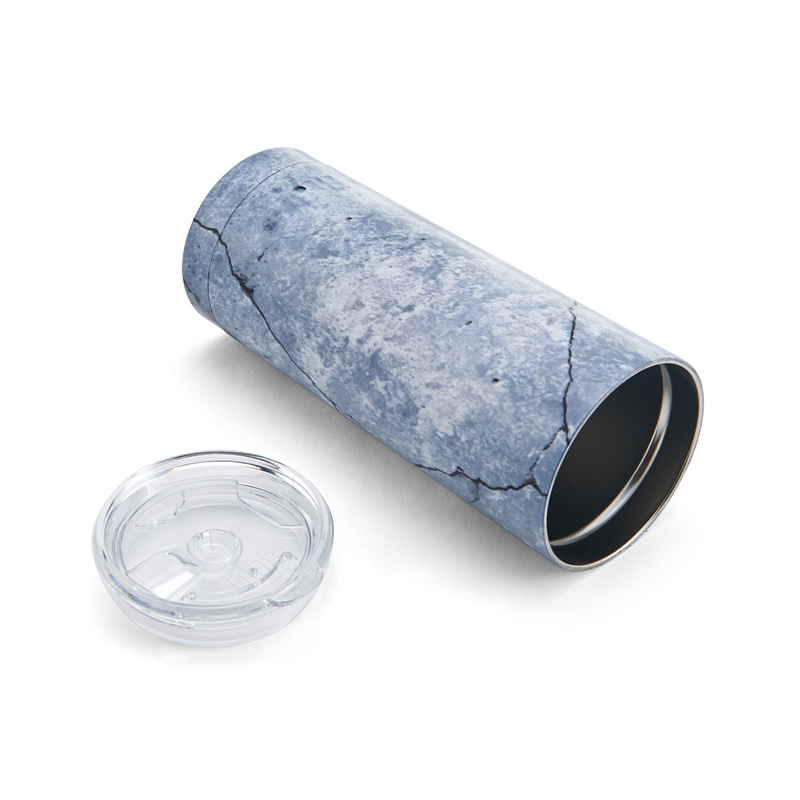 If your foodie friend prefers iced drinks, this tumbler will keep it cold for 24 hours as well! It has a sleek design that fits in most cup holders and a screw top for a secure fit — no chance of spilling all over a brand-new sweater this year! Get it from Walmart for $7.94 (available in eight colors). 2. A 19-piece kitchen utensil set that will have any stocking overflowing with cooking excitement. It doesn't get much better than this, friends. Whether the person you're shopping for just moved into their own place or could really use a replacement of kitchen basics, this set is a freakin' bargain. It comes with an adorable emoji timer, a 10-piece measuring spoon and cup set, spatulas, a whisk, tongs, and a three-piece strainer set. What more could you want? Get it from BuzzFeed's Tasty collection for Walmart for $14.88. 3. A marble cheese slicer and snacking set for your friend who insists on putting together a cheese platter for every occasion. Complete with a tasty block of cheddar cheese, crackers, sausage, and the cheeseboard itself, this would definitely be delightful to find inside a stocking! Get it from Walmart for $16.98. 4. A floral oven mitt and pot holder set that will brighten up the kitchen and prevent your clumsy cooking buddy from burning themselves...again. This vintage-inspired set from The Pioneer Woman is nearly too pretty to actually use in the kitchen! If you're anything like me, constantly pulling things out of the toaster with my bare hands, you will really benefit from getting these in your stocking. 5. A handheld grater, so your friend can painlessly shred cheese, chocolate, or whatever else their heart desires. Get it from BuzzFeed's Tasty collection for Walmart for $7.80+ (available in four colors). 6. A tortilla bowl mold that will take Taco Tuesday to places you and your roomie never dreamed of. Psh, you thought guac was extra? Just wait until you try out this product. Toss one of these into your taco-loving roomie's stocking then insist you whip up a Mexican feast for NYE. The molds make crispy, low-fat tortilla bowls without frying for a taco salad you'll want every night of the week. Get it a set of two from Walmart for $15.70. 7. A cocoa and mug set for the two people in your life who are always down for s'more sweet treats. Do you have two stockings to fill this year? Divide up this delectable s'mores set and encourage both recipients to spend a night together whipping up a fun dessert. The kit comes with two snowmen mugs, Dove chocolate, graham crackers, and marshmallows — everything you'd need for a successful indoor s'mores making sesh. 8. A pair of heat-resistant mitts that your friend who is constantly raving about their Instant Pot meals will simply gush over. No judgment here — the Instant Pot is a life-changing product for busy people who still want a homemade meal. But it gets HOT. Give your Instant Pot-loving friend the gift of protected hands by tucking this set of silicone mini pot holders into their stocking. Get a set of two from Walmart for $6.78+ (available in five colors). 9. A collection of miniature hot sauces, perfect for that coworker who is always suggesting you "spice up your life." Whether they love dousing their meal-prepped lunches in hot sauce or simply enjoy kicking everything they eat ~up a notch~, the spicy-food fanatic in your life will appreciate this saucy gift. Complete with 12 different hot sauces, this is one stocking stuffer that will keep things interesting. Get it from Walmart for $14.98. 10. A solid can opener that literally anyone you gift this to will use on the daily. Never underestimate the power of a good can opener! This one features a silicone handle, so the grip is soft and easy to grasp. It also comes with a built-in bottle opener so your bestie can expand their fridge to include more than just twist-off beers. Get it from BuzzFeed's Tasty collection for Walmart for $7.44 (available in four colors). 11. A personalized, color-changing mug for your mom, who can't get enough of you and your siblings. I got married this year, so everyone in my life is getting some sort of customized photo-centric gift from my special day (aren't they lucky?!). You better believe I'm adding a whole slew of pictures to this mug and plopping it directly into my mom's stocking — she's gonna love it. You can add up to five photos to this mug, so you can cover all of mom's favorites (you, your sister, AND the dog) in one stocking stuffer. Fab! 12. A colorful measuring cup and spoon set, so maybe (just maybe!) you can convince grandma to write down exact measurements instead of suggested "a pinch of this" or a "handful of that" in her famous cookie recipe. Whether you want to gift them to an aspiring child chef or your grandparent who has been using the same measuring cups for ages, this stylish set is perfect for bakers of all ages! 13. A package of gourmet green tea that can be divided up amongst your fam's stockings so everyone has something to sip on this winter. If you're from a big family, it can be hard to find something each member of your clan enjoys. This set of tea comes with six different kinds, so whether you sneak a tin into grandpa's stocking, your brother-in-law's, or your great-aunt's, there is a good chance of finding a flavor they'll enjoy. Get it from Walmart for $13.98. 14. A mini herb saver for the home gardener who insists it's about ~thyme~ we all grow our own seasonings. My husband recently started growing a variety of spices in our kitchen (think thyme, basil, mint, etc.) and has since begun placing them in the fridge in plastic bags. If you're living with a similar scenario, you need to gift your roomie (or significant other) this mini herb saver. It's small enough to keep in the fridge door and it protects the herbs from getting crushed. 15. A mason jar that your BFF who loves nothing more than prepping overnight oats will be delighted to find in their stocking. Whether you use it for meal prepping, to drink serve iced tea out of, or to store candy, there are so many uses for a basic mason jar that anyone would be thrilled to get one for the holidays. Dress this jar up with a little ribbon and fill it with something tasty before adding it to your bestie's stocking. They'll love it! Get a set of 12 from Walmart for $7. 16. A colorful kitchen gadget for your friend who likes to take whisks on new recipes. Ha ha, get it? This whisk is ideal for basically anyone in your life who lives to bake. It's bright, colorful, and functional. Sounds like a winning stocking stuffer to me. Get it from BuzzFeed's Tasty collection for Walmart for $4.44. 17. A banana-slicing tool that is so easy to use even a monkey (or your friend that's only minimally capable in the kitchen) could do it. Does your officemate start every morning off with a healthy breakfast of a banana and peanut butter? Or maybe your best friend loves chopping up banana to put in their cereal? Once their stocking is hung by the fire with care, toss this bad boy in there for a sweet surprise. 18. A five-piece soup gift set, so your favorite homebody will be prepared for the next time they get snowed in. Just looking at these lil' soup mugs makes me feel all warm and cozy inside. The set comes with four mugs (one for tomato soup, chicken soup, potato soup, and vegetable soup) in addition to a chicken noodle soup mix. Your buddy will be all set to hunker down with a warm meal this winter. 19. And a pineapple corer for the lucky person in your life who likes piña coladas and getting caught in the rain. You don't need to visit Hawaii to get the tropical drink of your dreams — all you need is this pineapple corer! It's small enough to fit in a stocking, but definitely a game changer for your luau-loving BFF. Don't forget to include a package of paper drink umbrellas! Get it from Walmart for $6.32.